DSEK is useful in patients with varying types of endothelial dysfunction, including Fuchs dystrophy, Pseudophakic bullous keratopathy (PBK), Aphakic bullous keratopathy (ABK), and Posterior Polymorphous dystrophy (PPMD) (Melles et al, 1998, Terry & Ousley 2001). 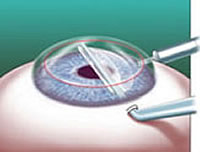 Recent modifications to this surgery include the use of "ultra-thin" grafts (ultra-thin DSEK) and transplanting only Descemet's membrane (DMEK). These newer techniques seem to offer better visual outcomes and are used in our patients who are appropriate candidates.